Now let's look! I have 5 out of the 7 shades and 1 of the 2 top coat shades from the Pixie Hollow collection. Let me start by saying the formula on each of these was very consistent and absolutely perfect. Each swatch is two coats with Glisten and Glow HK Girl top coat, unless I've written that it's top coated with The Glam Polish holo top coat, Gliss. All of the shades in this collection are so saturated with vibrant color! Glam Polish Iridessa - a bright yellow base packed with silver chrome shimmer. In my opinion, it's nearly fluorescent and glows a bit green. 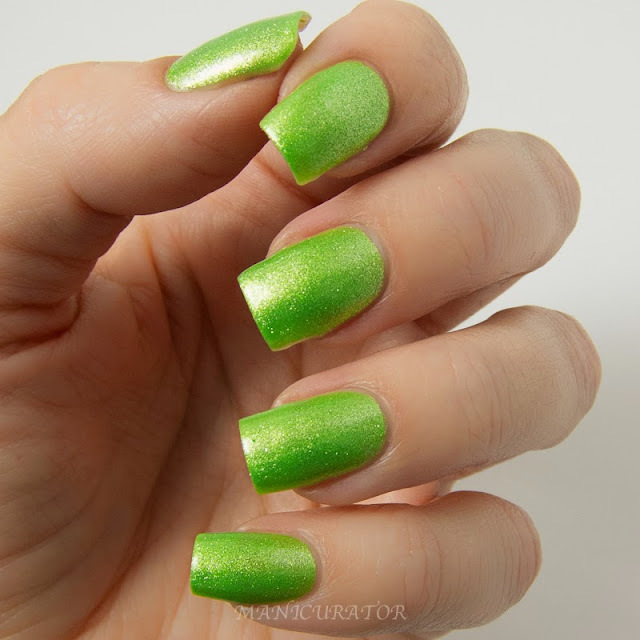 Glam Polish Tinker Bell - a bright lime base packed with silver chrome shimmer. Very fun! The following two photos have one coat of Gliss. Adding the holo top coat on top of the silver shimmer polish created such a beautiful combo! 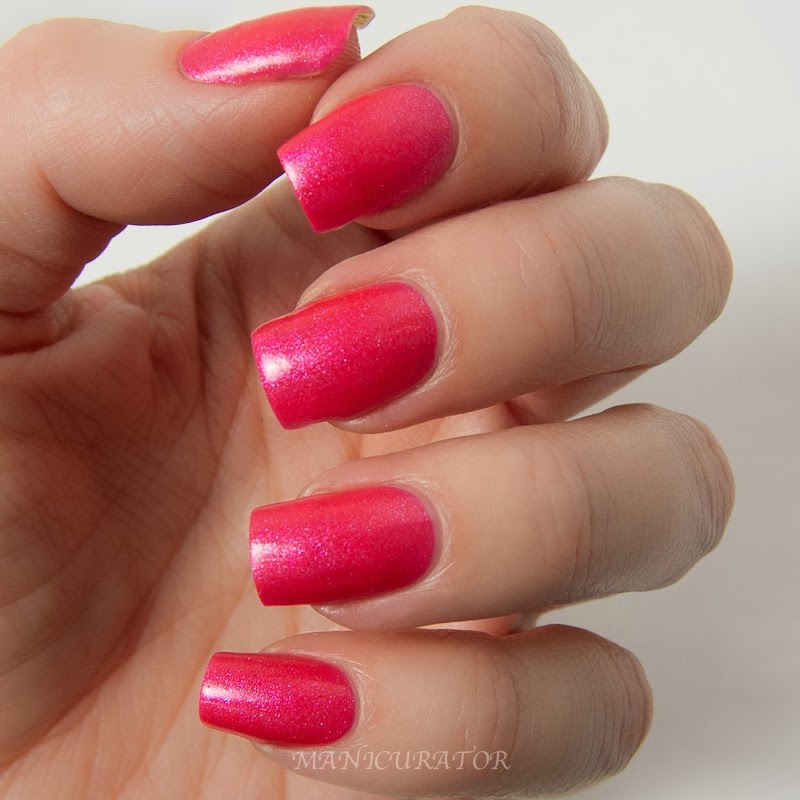 Glam Polish Rosetta - a bright magenta base packed with silver chrome shimmer. I actually had trouble getting this one to photograph accurately, it's so vibrant that the color bounced everywhere! I had to color correct as best I could in the editing phase! The following two have one coat of Gliss top coat. In my opinion, the holo top coat over this one and the next two darker shades really made the holo pop more than over the lighter shades. Again, the following two photos are showing with one coat of Gliss. And lastly, a stunning blue! 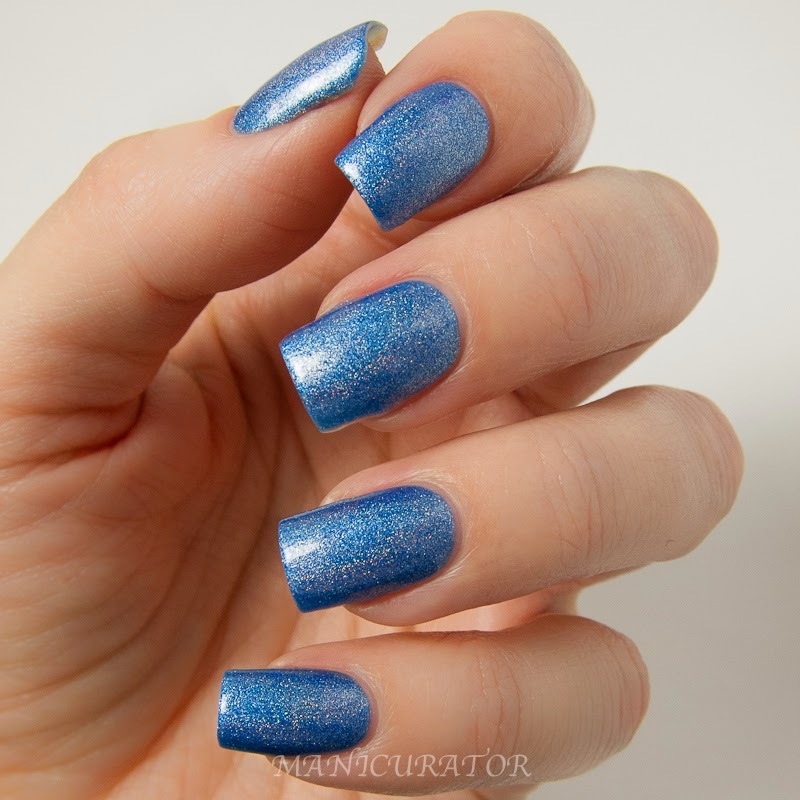 Glam Polish Silvermist - a bright blue base packed with silver chrome shimmer. Pretty much a must have for all my fellow blue lovers! Finally, the last two photos show an added coat of Gliss. 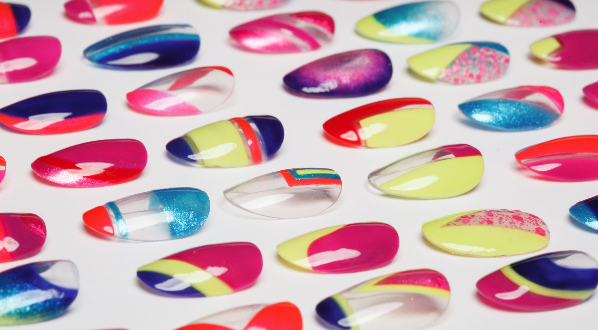 This is the base I used for my nail art look for Nail It! magazine pictured above. 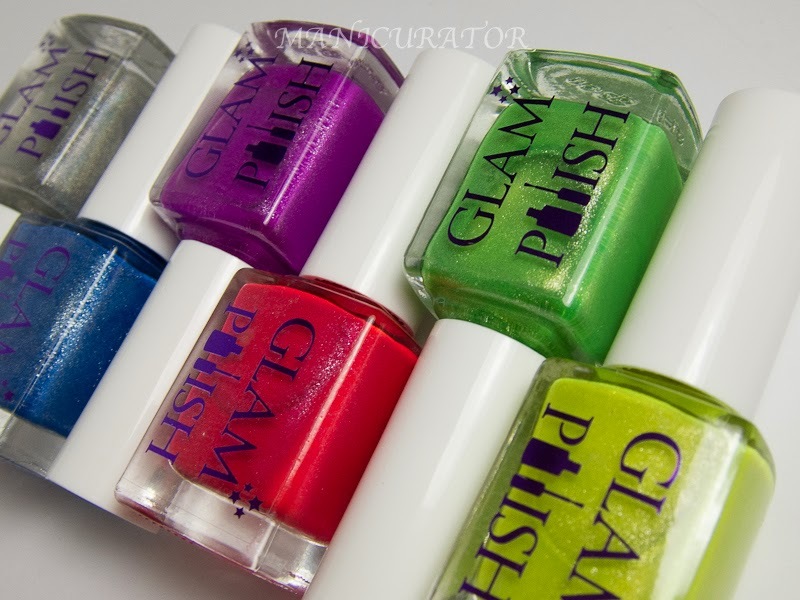 Have I made it obvious that I'm a fan of this collection and now a fan of Glam Polish? I love each shade more than the next! Have you tried Glam yet? Which are your faves? 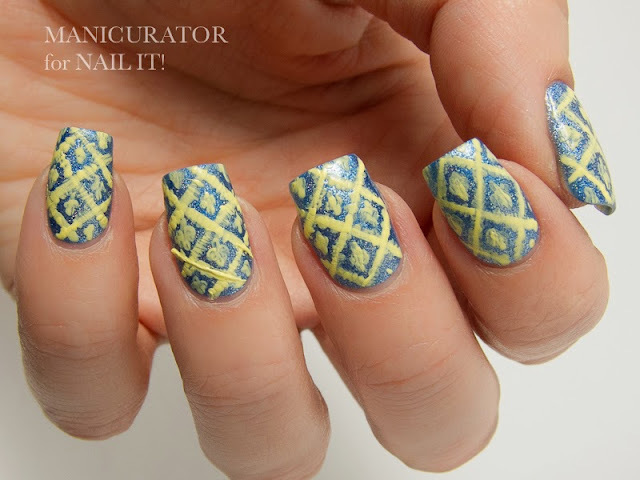 Beautiful polishes and I really like your argyle design! 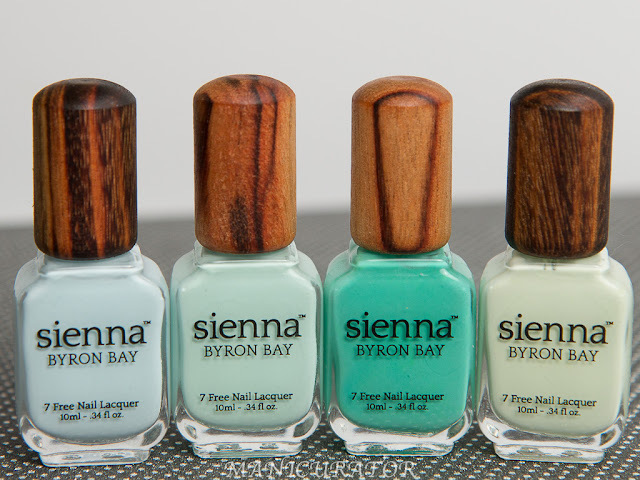 I think my favorite of the polishes that you swatches is that yellow/green one...it's so pretty! All of these polishes are so vibrant! Love them all. That green shade reminds me so much of an elf green =) TFS! OK, WOW!!! SO MUCH BEAUTY IN ONE POST! Yes, I had to use the caps. lol.. I love how bright these colors are. I'd love to wear them during the gloomy winter! Wow, these are all so beautifully pigmented! And that nail art is AMAZING! These are BEYOND stunning! Oh my, I am drooling right now! So let's talk Vidia. Um, LOVE it! One of the prettiest shades of purple I've seen in awhile! Perfect swatches! I love Gliss over Vidia!